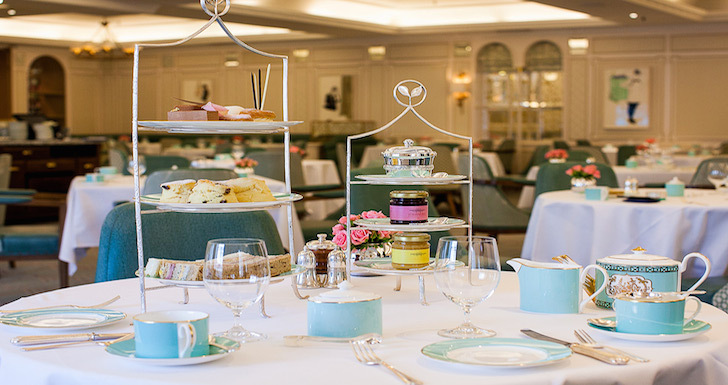 Afternoon Tea at Fortnum and Mason, taken in its elegant Diamond Jubilee Tea Salon, is a sparkling tea tasting adventure guided by a resident tea expert. As a shopping destination for food lovers visiting London, Fortnum & Mason is simply unmissable. This iconic food emporium oozes with Britishness and tradition. My advice to you when you visit, is to make time for tea. Smell and taste classic teas from around the world in the Food Hall. Better still, spoil yourself or someone you love, with the gift of a Champagne Afternoon Tea in Fortnum & Mason’s elegant Diamond Jubilee Tea Salon. It’s a genteel affair but a special one and without doubt, one of London’s best Afternoon Tea experiences. Go home with preserves from the Food Hall. Don’t forget to stand outside the store on the hour and watch the clock strike to see Mr Fortnum and Mr Mason pop out. With strong family ties to the East India Company, Fortnum and Mason has been sourcing and selling tea for over 300 years. Established way back in 1707, the grocery store and tea dealer later became known for its exquisitely packaged fine foods and strong royal connections. As official grocer to the Royal household, its fourth floor Diamond Jubilee Tea Salon, where Afternoon Tea is served, was officially opened by Her Majesty the Queen in 2012. Crisp white tablecloths, eau-de-nil fine china, piano music and attentive waiting staff in smart uniforms, make it one of London’s top venues for a stylish and refined Afternoon Tea experience. The centrepiece of Fortnum’s award-winning Afternoon Tea are the scones. Thousands are freshly baked on-site each day. Dusted with icing sugar and served with Somerset clotted cream and Fortnum’s finest preserves, they sit on the silver cake carriage beside fancy cakes and traditional finger sandwiches. Tasty sandwich fillings include Coronation chicken, a dish created for the Queen’s coronation luncheon in 1953. What makes Afternoon Tea at Fortnum & Mason even more charming are the ‘Tearistas’ – resident tea experts. As you sample the teas, they’ll tell you the stories behind where the teas are grown and how they’re made. Mr Hendricks says, “Fortnums tell me that they do not currently allow animals other than guide dogs into our stores.”.